Luis Suarez's second half goal cancelled out Cristiano Ronaldo's equalizer to help Barcelona past Real Madrid in a highly-competitive El Clasico. Two teams. Two captains. Two coaches. Two superstars. One of the greatest football games in the world. Nou Camp understood the significance and magnitude of this match as they raucously welcomed both sides out as vibrant light shone down on the pitch with a night sky watching on above. Cristiano Ronaldo, a man in desperate need of form used his blistering pace down the left while absorbing thousands of boos ringing from the home fans. Rakitic dispossessed him near the corner flag; swapping boos for raucous cheers. Iniesta drove down the left, entering Madrid's area with real intent. The Spaniard cut back to Rakitic but the Croatian was unable to convert the ball home. There was brief worry regarding Iniesta, though, as he fell to the ground holding his ankle in clear agony. Replays showed Carvajal accidentally trod on his foot but nonetheless the Barcelona captain made it back to his feet. Marcelo scampered down the left channel; diverting centrally where he cut back to Benzema on the edge of the box. The Frenchman hesitated on who to assist but eventually chipped a dangerous ball at the back post towards Ronaldo, however the Portuguese international's effort from close range clattered off the crossbar. With the ball recycled, Isco took a stride and drilled a low shot towards the bottom right hand corner. It certainly piqued the conscience. of Bravo who would have had the effort well covered. Tensions were suddenly broken when the hosts drew first blood. Messi whipped in a free kick on the left; finding Jeremy Mathieu who positioned himself in front of Ramos and fired a sublime header past Casillas into the bottom right hand corner. Poor defending from Madrid, they should never have allowed that movement within their back line. Barcelona would almost double their lead as a simple chance for Neymar to do that presented itself. A superb low ball found the young Brazilian unmarked but his unknown hesitation resulted in a simple flick-up reaching Casillas at close range. It may have been nerves that cost Neymar an imminent goal but if another chance of that kind occurred once again he had better take it. After the home side missed a glorious opportunity, Madrid punished them a few moments later. Modric drove forward, picked out Benzema on the edge of the box who superbly flicked over to the charging Ronaldo. The Portuguese man took a stride forward and toe-poked past Bravo; silencing the previously raucous Nou Camp. Madrid should have been two goals up after an incorrect offside decision was given against Bale. Benzema curled a looping ball over to Ronaldo in the middle of the box where he cushioned it down to the Welshman, only for his precise toe-poke to be cancelled out by the offside flag and it really shouldn't have been. Poor, poor decision. 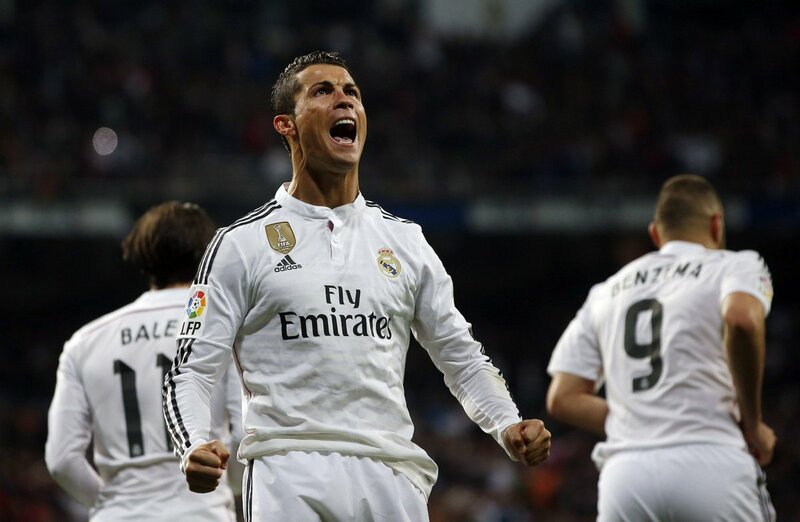 Ronaldo drifted into the middle and battered a thunderous strike at goal. It was heading in if it wasn't for Bravo's terrific finger-tip pointing the ball over his crossbar and out for a corner. From that specific corner, the ball ricocheted down from Benzema in a small scramble where Bale took a chance and poked towards the left hand corner. His effort agonizingly fell wide of goal and anxiety began to build among the home fans in attendance. Mateu Lahoz blew the half time whistle with both sides heading into break on level terms. Madrid appeared to be the better team as they created more chances against Barcelona who lacked a high tempo to their game. Madrid displayed a cracking piece of counter-attacking play up top. Marcelo, Ronaldo and Benzema implemented a slick passing sequence; resulting in the Frenchman retirivig possession one-on-one with Bravo at close range. He flicked the ball with no real intent and the Barcelona goalkeeper did well to palm away. Messi was surprisingly quiet in the first half despite his assist and manager Luis Enrique surely instructed more involvement from his main man and that's what he got as the dazzling Argentine blistered centrally; leaving his opponents for dead until Modric had no choice but to clip Messi and break the dangerous move. Nou Camp was also lacking a real buzz since Madrid's equalizer. That was drastically changed with a sublime goal. Suarez, with several yards on his marker Pepe up top received a terrific ball from Alves. 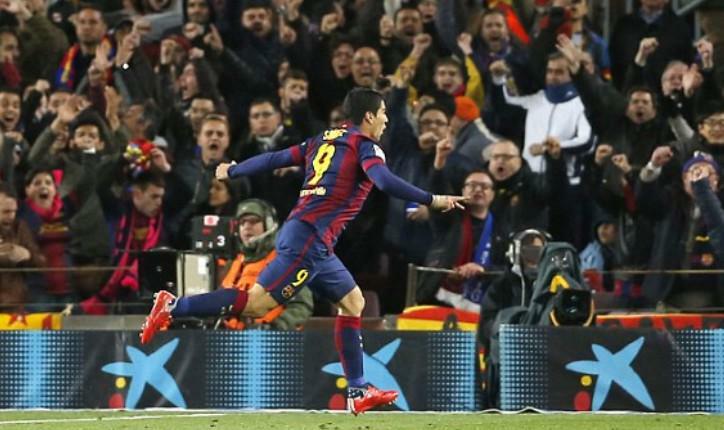 The Uruguayan took a touch, strode over to the right and superbly slotted past Casillas to restore Barcelona's lead. Neymar scampered from the half way line towards Casillas' area with Suarez also making a promising run alongside him. Dribbling to his right, the Brazilian took the shot himself but frustratingly for Barcelona, blootered over the crossbar. Messi blistered in from the right to a central position with real intent of scoring. Fans slowly stood to witness what looked to be a third goal, however the Argentine tantalizingly curled his shot wide of goal. The Argentine was at it again as his blistering pace and dazzling footwork looked set for a third goal. He knocked the ball to his right, finding Neymar, only for the Brazilian to ridiculously batter over and wide. Benzema charged forward in desperate need of a goal and almost grabbed one when his shot deflected off Mascherano and Pique; forcing Bravo to get down low and turn the ball around his post. Alba had been causing problems for Madrid all night and he almost got his reward. Messi stabbed a ball through to the charging Spaniard but his toe-poke was superbly stopped by Casillas at close range. Alba scorched down the left channel and returned the favour to his team-mate Messi with a cut-back to the middle. The Argentine latched on it and powered a ball at goal, only to be denied by the resilient Casillas, looking to keep his rich reputation intact. The Nou Camp erupted in wild celebrations as Barcelona toppled Real Madrid courtesy of goals from Suarez and Mathieu; cancelling out Ronaldo's equalizer in a hard-hitting contest. Comment: Time for change at Man City? Luis Suarez defeats Real Madrid in El Clasico.